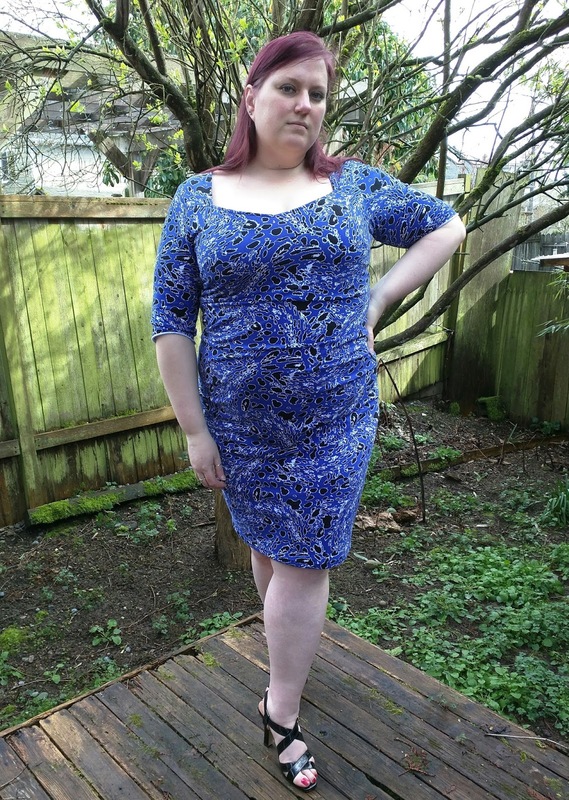 Several months ago, I started making view C of McCall's 6801 from a cotton lycra fabric that I got in my knitfix bag in July. I got to a step that needed to add seam binding to the side seams and didn't have any, so it got added to the UFO pile for a while. The February Monthly Stitch UFO challenge made me fish it out and finish it. I made the size according to my measurements and sewed it up exactly according to the instructions. But the dress ended up being way too big. So I took it in quite a bit on the side seams and I ended up just cutting off the seam binding anyway. I think the gathers on the side would be held in place much better using the seam binding, but I don't mind the way it is now. The back neckline gapes some. But it could just be stretched out from trying it on so much. I steamed it a bit and it seemed to shrink up, but I took it off and put it back on a couple of times since then, so it may have stretched back out again. It's hard to tell. The lining was cut from a firm nylon Spandex blend fabric and I took it in slightly more until it was smaller than the outer dress and could help smooth things out so the dress could skim over my lovely lady lumps. I think it worked out pretty well. 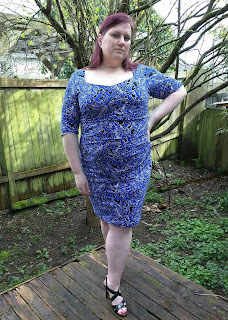 I am quite pleased with this dress and my husband likes it too. 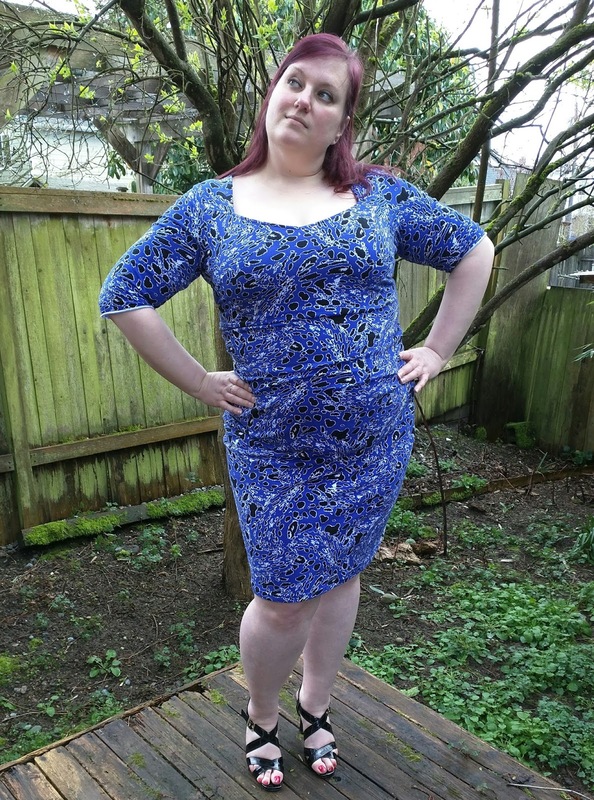 I plan to try it again in a smaller size in the future before making any pattern alterations. Wow! 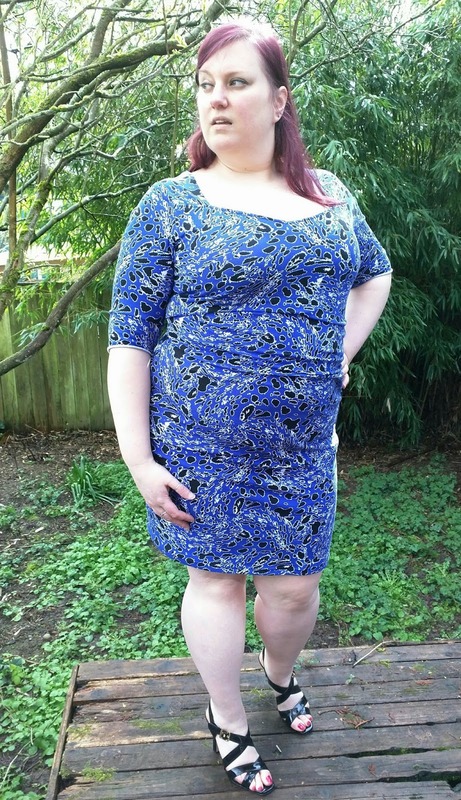 What a va-va-voom dress! I love it! I need to occasionally think outside my normal style box. 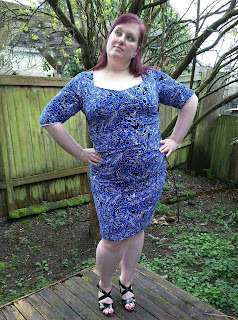 Following you from Carolyn's post on the Seattle Fabric Tour and your comment on my blog! Thanks so much for stopping by. Send me an email: gmariesews - gmail and I'll add you when I have sewing gals up to the house next time.